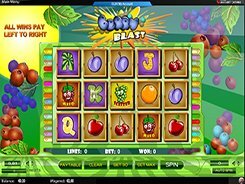 Fruit Party is a 5-reel 9-payline video slot developed by Amaya and themed around fruit. The symbol set includes lemon, watermelon, grapes, orange, cherry, cocktail glasses and other themed icons. A coin value is adjusted from $0.01 to $5, with a maximum of five coins accepted per line, so a total bet may range from $0.09 to $225 per spin. A coconut cocktail serves as a wild symbol that substitutes for other cocktail symbols and helps complete winning combos. 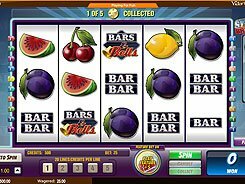 Hitting five wilds along an active line awards the slot’s biggest prize worth 5000 coins or an eye-watering $125,000 (on the max stake). 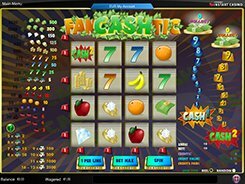 The slot features two different scatter symbols that award scatter wins if you match at least three of them on adjacent reels. The maximum prize paid out by scatters reaches 2700 coins. Finally, there is the Party Pick feature where you are to click items to reveal bonus multipliers. 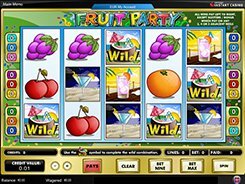 Offering very flexible bet options, Fruit Party will definitely appeal to both low-limit players and high rollers alike. PLAY FOR REAL MONEY!